My Cozy Corner: I Decorated a Cake! Good Morning it's TGIF. Last night I took my second cake decorating class. Of course you know I love Cupcakes!!! This is my first attempt at decorating a cake with decorating TIPS. I love them. The class is offered at Michaels Craft Store and we are using the Wilton Lesson Plan. The icing is a class Butter cream Icing. Using a tip 3 and yellow icing to pipe curving lines on the baking cup. 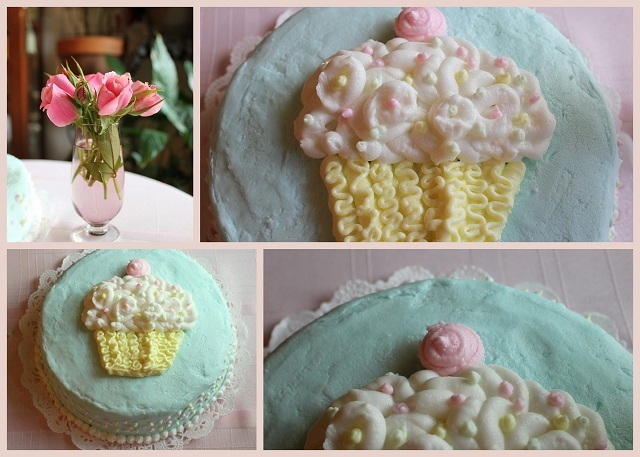 I used tip 12 and white icing to pipe swirls on the cupcake top. Using a tip 12 and pink icing to pipe the decoration on the top of the cupcake. The bead bottom I used tip 12 and white icing. I'm so happy I finally took this class. The decorating tools are so important and to have a someone personally show me the decorating techniques is awesome. I am a very visual person. As you can see by the way I blog. I joining some great parties. Please link back to them for more eye candy. Awesome cake! Love the pastel colors! Adorable! I love cupcakes too. Oh, so pretty!! You did a great job! I'm here from Foodie Friday. Hi Betty, Your cake looks great. I cant decorate a cake for beans! it's not as easy as it looks. My sister is good at it but not me...so I will just enjoys hers and yours! LOL! Looks like you are learning your lessons well. Such gorgeous pink! Happy weekend! Shade of Pink at my page. That is just beyond cute--adorable! Thanks for sharing! Awww that is adorable! Happy Pink SAturday! The cake looks so pretty with the cute cupcake on it. Well, I'm impressed ! It looks wonderful. Betty..that is just a work of art. I am so happy we have blogs so you could share that sweetness with us. You did an amazing job. Wow great job it is soooooooooo cute! Its like all my favorite colors and I love cupcakes too! ps- I am your 200th follower =] congrats on hitting the 200's I am almost to 100 I'm so excited! Wow, this is great for a second lesson!! I agree, use up the icing, and I like that you covered the cake! i am so about the frosting, so this one takes the cake!